According to a new survey conducted by the Research Institute for Compassionate Economics (r.i.c.e), 85% of the Ujjwala beneficiaries in rural Bihar, Madhya Pradesh, Uttar Pradesh and Rajasthan still use solid fuels for cooking. i. Cooking with Solid fuels can lead to infant deaths and harm child development, heart and lung disease among adults..
ii. Out of 85% of the surveyed households, 53% exclusively used the chulha, while 32% used both. ♦ Launched in 2016, it is a scheme of the Ministry of Petroleum & Natural Gas. It aims to safeguard the health of women & children by providing them with a clean cooking fuel. The scheme provides free LPG connections to economically weaker families. i. Some issues like the management of the extant security dynamics, mitigation of future security threats were discussed in this conference. ii. Other issues, such as development of infrastructure for improvement of capacity along the Northern borders, review of strategic railway lines, optimization of a limited budget to ensure making up of critical insufficiency in ammunition and welfare of troops also discussed. iii. Defence Minister Nirmala Sitharaman delivered her opening address at the conference and the Chief of the Army Staff, Bipin Rawat, chaired the conference. A music and poetry festival titled ‘Jashn-e-Ittihaad’ was held at the Jamia Milia Islamia central university in New Delhi to spread awareness about unity amongst the youth. i. The festival was organized by Delhi-based entertainment company Question Associates Pvt Ltd.
ii. In this event, people enjoyed the soulful Hindi and Urdu poetry, music and performances that made them feel good as well as spread awareness about unity and integrity. iii. Some great poets like Irshad Kamil and Waseem Barelvi participated in this festival. In the programme organized at Mon (Nagaland) during the Aoleang Monyu festival (usually held between 1st April to 3rd April every year) around 5000 Konyak Naga women in their traditional attire attempted to set a Guinness World Record for the ‘Largest Traditional Konyak Dance’. i.The festival is celebrated for the arrival of Spring and for a good upcoming harvest. iii.Konyak Union in coordination with other organisations of the tribe, namely, Konyak Nyupuh Sheko Khong (KNSK) and Konyak Students’ Union (KSU) organized the event. iv.The objective of the event was to preserve the cultural heritage of the region and the people and to promote tourism. ♦ Mon is a district in Nagaland in the North Eastern India. ♦ The Konyak people, known mainly for their tradition of head hunting, are the largest of 17 officially recognized tribes in Nagaland. Lingnyu Nyih (is the 4th and the most important day of the Aoling festival as the tribals dance, sing and feast to symbolize their victory as head-hunters). National Thermal Power Corporation(NPTC) has signed a term- loan Pact of Rs.2,000 crore with Canara Bank. The Loan facility prolonged at an interest rate linked to 3-Month MCLR of Bank. The lent amount would be utilized to part finance company’s capital expenditure. i. The tenure for the loan is 15 years . ii. For part financing company’s capital expenditure, NPTC had inked a term-loan agreement for Rs.5,000 crorewith State Bank of India in February, 2019. ♦ It is a State run power giant of Electricity included under the Companies Act 1956. ♦ The headquarters is located at New Delhi. ♦ Gurdeep Singh is the Chairman and Managing Director of NTPC Limited. ♦ It is an Indian Government owned public sector bank established by Ammembal Subba Rao in 1906 at Mangalore. ♦ The Headquarters is situated at Bengaluru. The World Bank notified that India’s consistent hold in investment sector, mainly private-improved exportperformance and resilient consumption, has led its GDP growth forecast to mount to 7.5 per cent for fiscal year 2019-20. The real GDP growth is estimated at 7.2 per cent in FY18/19. According to the latest World Bank’s report onSouth Asia, data for the first 3 quarters show that growth has been broad-based. Industrial growth sped up to 7.9 per cent which means the services growth will decelerate. Agriculture growthremains at 4%. The 2019 Malaysia Open, officially known as the CELCOM AXIATA Malaysia Open 2019, is a badminton tournament which takes place at Axiata Arena in Malaysia. It has a total purse of $700,000. This year, sports event was held in Kuala Lumpur, Malaysia from 2nd to 7th April, 2019. It was organized by the Badminton Association of Malaysia. i. Lin Dan of China has claimed title in Men’s Singles category by defeating China’s Chen Long, whereas Tai Tzu-ying of Chinese Taipei has claimed the title in Women’s singles by defeating Akane Yamaguchi of Japan. ii.Ranked as No.1 in world, Tai Tzu Ying will retire from Badminton after 2020 Tokyo Olympics. The Guwahati Railway Station has become the first ever railway station in the Indian Railways to get an ISO (International Organisation for Standardisation) certification from the National Green Tribunal (NGT). i. It has been given this certificate for providing passenger amenities in a clean and green environment. ii. ISO certification received by Guwahati Railway Station is ISO-14001, which is for Environment Management System as per international norms which were upgraded in 2015. 73-year-old Israeli Isaak Hayik set a new world record as the world’s oldest person to play in a professional soccer match. He played a match for FC Ironi Or Yehuda against FC Maccabi Ramat Gan. i. The previous record holder was 53 years old Uruguayan Robert Carmona who played a professional match in 2015.
ii. Hayik was born in Iraq and immigrated to Israel with his parents. He was officially recognized in an award ceremony attended by representatives from the Guinness World Record organization. Usha Padhee became the first woman CMD of Pawan Hans Ltd.
Odisha cadre IAS officer, Usha Padhee, has been given additional charge as the Chairman & Managing Director of Pawan Hans Ltd, helicopter services providing company. 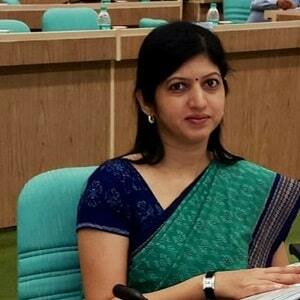 Currently , she is serving as the Joint Secretary of Department of Civil Aviation. i. With this appointment, she becomes the first woman CMD of the mini ratna-I category PSU (Public sector undertakings). She also served as the Director of the Pawan Hans Ltd and Additional Director at Delhi International Airport Limited. ii. The post was vacant since the superannuation of then incumbent B P Sharma. Scientists from Tsinghua University and the Chinese Academy of Sciences’ Institute of Genetics and Development Biology have discovered a mechanism named “death switch” in the plant’s immune system that can keep the plant healthy. The research has been published in the journal named ‘Science’. i. This new mechanism triggers infected cells to self-destruct and thus limiting the spread of the disease. ii. Also, this discovery gives the clues for cell death control, immunity for plants, and can lead to a new generation of disease-resistant crops that use significantly less pesticide and are more environmentally friendly.